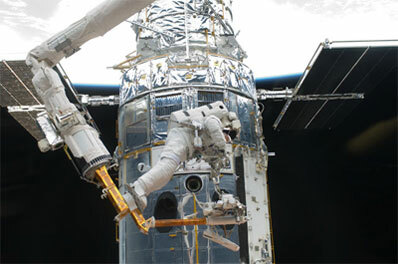 Astronauts Michael Massimino and Michael "Bueno" Good are preparing for a six-and-a-half-hour spacewalk to swap out the Hubble Space Telescope's six stabilizing gyroscopes - the top priority of Servicing Mission 4 - and three of its aging nickel-hydrogen batteries, now operating at half their original capacity. "They are 20 years old," said Hubble Program Manager Preston Burch. "They were built a couple of years before we launched in '90. We're so far beyond the design lifetime it's anybody's guess as to how long they could continue to go. We know it's not infinite. So our best judgment is we should go ahead and still change them out." Hubble's gyroscopes, which help it lock onto and track its targets, are an even more pressing concern. The telescope was designed with redundancy in mind and while it was equipped with six gyros, only three were required for science operations. But gyros 2, 3 and 5 have failed and gyro 6 exhibits symptoms of a problem that eventually could knock it out of action. "We're flying on one and six," Burch said. "Four is in reserve, However, six, you may recall, has some flaky characteristics that were detected not too long after it was installed on servicing mission 3A (in 1999). We suspect it has to do with the suspension system in it. When you slew the observatory, the drift rate on the gyro changes significantly on it. That's the bad news. The good news is, it changes in a very predictable way. We cleverly put some flight software on board that enables us to use gyro 6 and not be confused or whatever by the shift in the gyro drift bias. "Now gyro one recently had a sudden surge in its motor current which is indicative of a temporary rotor restriction event. And this has happened (several) times. The current has gone up, but it's come back down. But it's still running at a value slightly higher than normal. So our best experts and our past experience tell us one is living on borrowed time and it could go at any time. Gyro four, although it's off and held in reserve, was used for a long time and has a lot of run time on it. It's up there, it's up around the 50 percent point in terms of probability of failure. It's not clear how long gyro four could last if and when we had to turn it on and use it. "So the bottom line is, all three of the remaining gyros have got liens against them if you will," Burch said. "Six because of the flaky suspension, one because of the flaky motor current and four because it's got a lot of run time on it. So you ask, how much longer can you guys keep going on gyros, even with a one-gyro science mode, and that becomes highly speculative. ... Our previous calculations showed we could probably get through 2009 with the gyros that we have. I think getting much past 2010 would be a bit of a stretch." Today's spacewalk was scheduled to begin at 8:16 a.m. Massimino and Good plan to change out all six gyros and to replace three of the telescope's six batteries. The other three, in a different location, will be swapped out during a spacewalk Monday. During preparations early today, flight controllers informed the astronauts that the new $132 million Wide Field Camera 3, installed during the crew's first spacewalk Thursday, had passed an overnight "functional test. "Hey, while I've got you guys, the Goddard (Space Flight Center) team reports we got a good functional test on Wide Field 3," astronaut Dan Burbank called from Houston. "That's great news, Dan," Massimino replied. For identification, Massimino, call sign EV-3, will be wearing a spacesuit with horizontal broken stripes while Good, EV-4, will use a suit with barber pole stripes. Massimino will be the designated "free floater" while Good will spend much of the day anchored to the end of the shuttle's 50-foot-long robot arm. This will be the 20th spacewalk devoted to Hubble servicing, the second of five planned for Atlantis' mission, the third for Massimino, veteran of the most recent previous Hubble servicing mission in 2002, and the first for Good. Going into todays's EVA, 15 astronauts have logged 136 hours and 30 minutes working on the space telescope, including seven hours and 20 minutes logged Thursday by Atlantis astronauts John Grunsfeld and Andrew Feustel. Replacing the gyro packages is not overly complex - each two-gyro rate sensor unit is held in place by three bolts and two electrical connectors - but it requires an astronaut to float well inside the telescope, within inches of delicate equipment that could be damaged by an inadvertent movement. "The access to the RSUs is really the hard part," said Tomas Gonzales-Torres, the lead spacewalk officer at the Johnson Space Center. "The task itself is a couple of connectors and some bolts and you take a box out. But it's really the access inside of the telescope that makes it difficult." Massimino described the work as "one of the more challenging (tasks) that we do." "Mike Good is on the robot arm," he said. "I'm going to get inside the telescope and then more or less I'll stop at one point and he has to rotate me on my back. And then put my feet in the foot restraint - we have a PFR (portable foot restraint) set up inside the telescope - because if I was to try to get in myself there's a good chance I would knock something I'm not supposed to. So pretty much go inside and act like a statute ... and let the other guy control you, move your body around and get your feet in the foot restraint. "And then, once I'm inside there, I get pretty close to the star trackers, which are the things you don't want to hit. ... My chest will come up within an inch or so of the star trackers. If you damage it, it's kind of like game over. It's the likely end of the telescope. if you just nudge it a little bit, it's not the end of the world but you'd have to recalibrate everything. Because those are the things, part of the system that works with the RSUs that help point the telescope really accurately." After the rate sensor units are replaced, Massimino and Good will turn their attention to replacing three batteries, in one box, in equipment bay 2. The battery module is mounted on the equipment bay door, held in place by 14 bolts and six electrical connectors. "Each battery has 22 cells in series along with heaters, heater controllers, pressure measurement transducers and electronics, and temperature-measuring devices and their associated electronics," according to the NASA/Lockheed Martin Servicing Mission 4 media guide. "Three batteries are packaged into a module measuring roughly 36 x 36 x 10 inches and weighing about 475 pounds. Each module is equipped with two large yellow handles that astronauts use to maneuverthe module in and out of the telescope." Good, on the end of the shuttle's robot arm, will remove the old bay 2 battery module and hand it off to Massimino, who will hand him a new unit. While Massimino stores the old battery pack for return to Earth, Good will move back up to equipment bay 2 and install the replacement. "For their first spacewalk of the STS-125 mission, Massimino and Good will spend the bulk of their time replacing three rate sensor units. Each unit is part of a rate gyro assembly, which sense vehicle motion and provide rate data for the telescope. The replacement units will be stored inside a protective enclosure inside the shuttle's cargo bay. Massimino will open the lid of the enclosure to allow Good, who will be riding the space shuttle's robotic arm for the spacewalk, to retrieve the first unit and carry it to the telescope. Massimino will also retrieve a gripper tool that Good will use to maneuver the units into place. "At the telescope, Good will retract two fixed head star tracker seals, allowing the doors on the telescope bay that the crew will be working in to open. Once open, Good will move a cross aft shroud harness inside the telescope to make room for the foot restraint Massimino will be using. Massimino will retrieve the foot restraint for Good to install, then Good will help Massimino into it. To remove the old rate sensor units, Massimino will disconnect two electrical connectors, while Good removes three bolts. The same connectors and bolts will need to be connected and tightened to install the replacement unit. "The two spacewalkers will repeat this process two more times as they replace the remaining two rate sensor units. If time permits, Massimino and Good will do some get-ahead work for the third spacewalk of the mission by installing a power input element harness for the Advanced Camera for Surveys before they move the cross aft shroud harness back into place and close the doors on the worksite. "After the new rate sensor units are installed, Massimino and Good are scheduled to perform the first half of the mission's battery replacement work. They'll be working in the telescope's Bay 2 to replace the first of two batteries. Good will retrieve the old battery by disconnecting six electrical connectors and unscrewing 14 bolts, while Massimino retrieves the new battery from its stowage location inside the shuttle's super lightweight interchangeable carrier. He'll have to unscrew 12 bolts to remove it. The two astronauts will swap batteries at the carrier, and Good will transport the new battery to the telescope for installation, while Massimino stows the old."